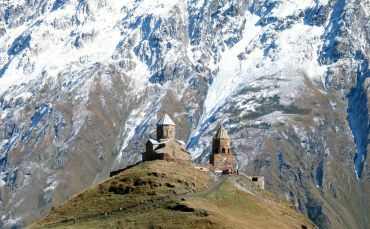 Symbol of Christianity in Georgia is Mtskheta , the first capital of Georgia. The most significant building of the city - the Cathedral of Mtskheta, built in honor of the Twelve Apostles. Place of construction was chosen. It is at this point Sidonia was buried, who died after she learned about the crucifixion of Jesus. This message informed her brother, who was brought from Jerusalem Heaton Lord. Sidonia so gripped the coat, it was not possible to pick it up, so was buried with him. Later on the grave of a huge cedar grew, became sacred to the people. In the 4th century the king of Miriam, on the advice of St. Nina, decided to build a temple on the place of burial Heaton Lord. Growing cedar could not cut down, and only thanks to the prayers of St. Nina tree trunk without the help of people up and down on the spot, becoming the first pillar of the future church. Soon pillar zamirotochil and wonderful ointment used to cure patients from serious ailments. 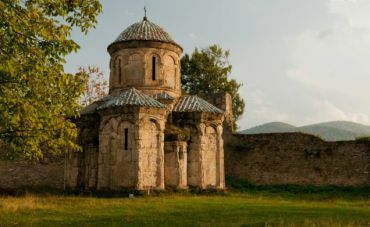 It gave its name to the Cathedral of Mtskheta, which translated means "the Living Pillar." 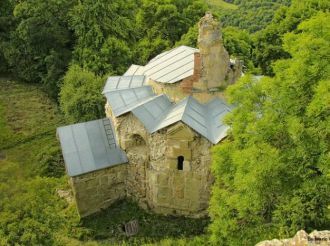 The original building was subjected to destruction, and subsequently decayed, and in the early 11th century, it was decided to build a new large temple. During its long history the cathedral been destroyed due to wars, but the temple rebuilt. This magnificent building is still impressive for its architecture, some exterior reliefs preserved in its original form. Interior walls painted with frescoes of a later period. In the church are preserved stone baptismal font of the 4th century, in which the King`s Cross. Over the Living Pillar, which is located almost in the center of the cathedral, built a stone canopy, decorated with frescoes. Before the altar are buried many of the Georgian kings, including Vakhtang Gorgasal. 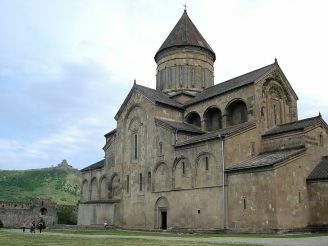 Svetitskhoveli Cathedral listed as a World Heritage Site by UNESCO as the largest preserved historic monument of Georgia.